It all started the summer of 2011. My mom heard of some family friends doing a family Olympic challenge. Theirs involved real weight lifting and some crazy athletic performances. 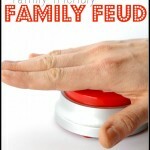 So she decided why not have our own family Olympics! But instead of tests of strength and agility we’d test out some other crazy things…like who can bob for apples the fastest or who can balance a tennis ball while running across the court. So ours were a little different, if you catch my drift. To get started, be sure to tell everyone involved a few weeks ahead of time to come with an event. The rules were that it has to be something everyone could do, you had to bring the supplies and it couldn’t involve anything that required real athleticism. (We really aren’t lazy people – we just prefer fun over not being able to walk the next day.) We have done it in a “every man for himself” sort of way and we have done it in pairs or couples…so choose what works best for you. Obviously each way will determine the types of games you play. 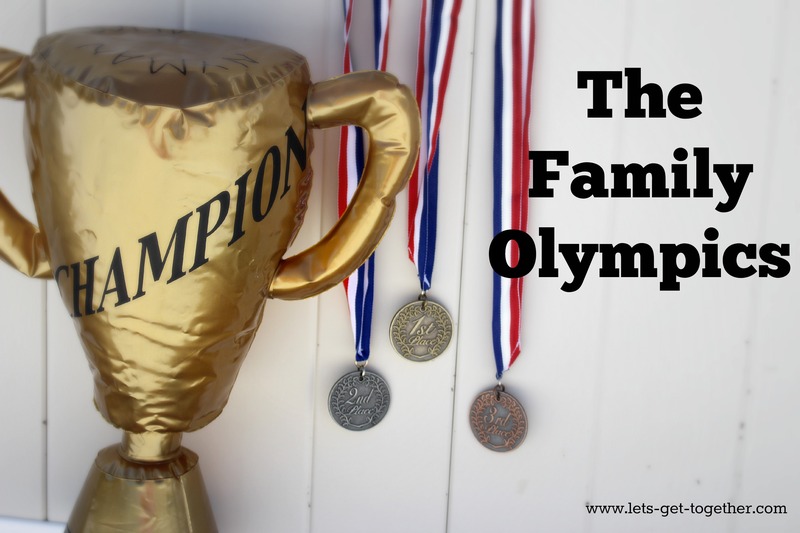 For prep work all you need to do is head to the dollar store to get some Olympic medals, a trophy (ours is a blow up one), plan some cheap but fun prizes and figure out a location. Parks work great for us. We don’t need to get all crazy here – just do what works for your family. 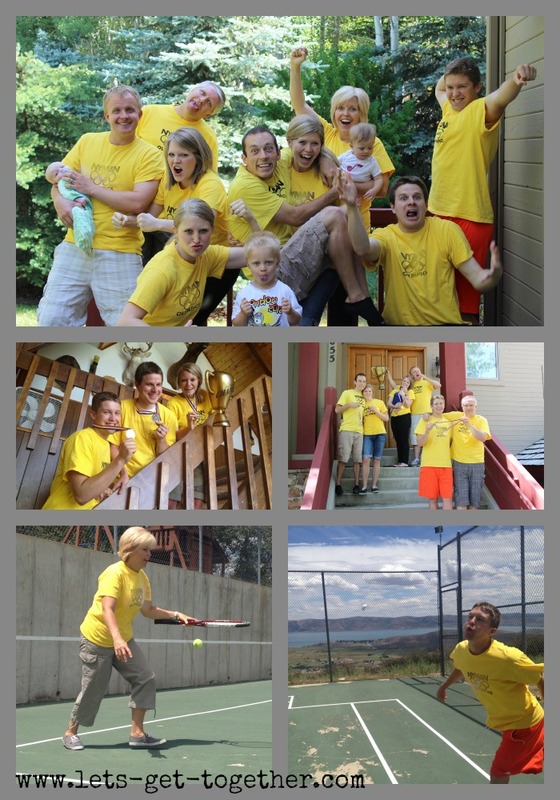 We knew this would be a yearly tradition so we also had t-shirts made, but that is totally optional and not necessary. 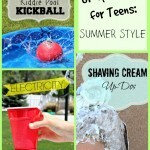 – Everyone got 1 point for participating in any event. – An additional point was given to the person who got 3rd place. – 2 additional points were given to the person who got 2nd place. – 4 additional points were given to the person who got 1st place. From there, all you have left to do is play! Just to help you get started, here are just a 6 of our favorite Olympic games we have played since we started our Olympic tradition. 1. 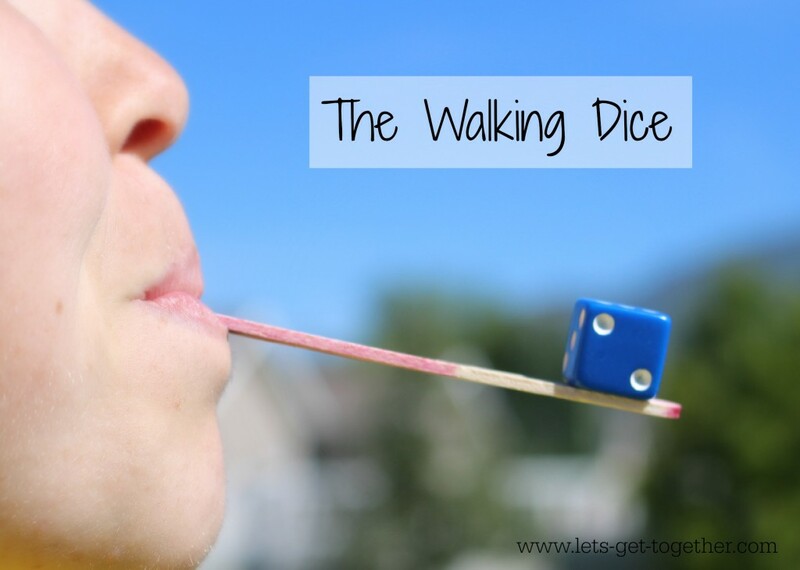 The Walking Dice: This game deals with finding that sweet spot between speed and balance. 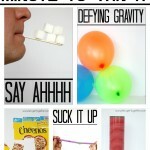 All you’ll need is some large popsicle sticks and dice. Each person gets a stick and 1 die. The key is to balance the die on the stick as you walk to a certain spot, turn around, and come back. We were outside so we did it from one end of the field to the other and then back. 2. 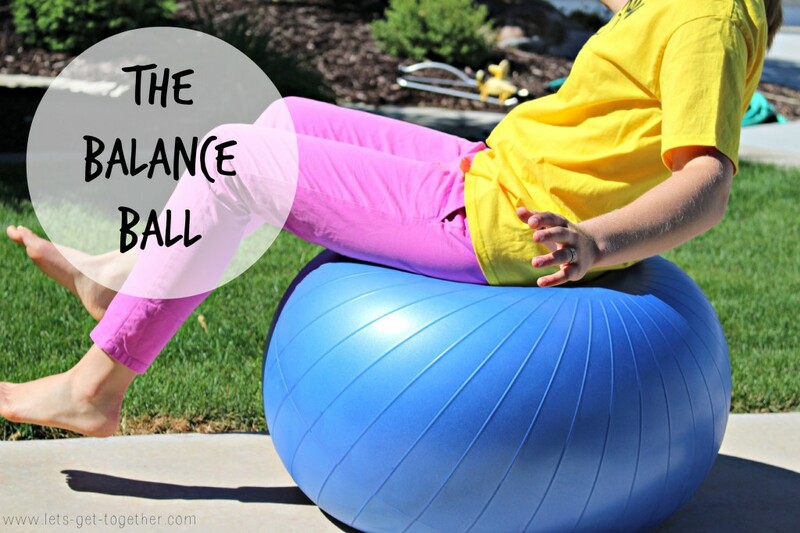 The Balance Ball: You wouldn’t guess this is as hard as it is – but it takes some serious concentration. All you need is an exercise ball and some space to move in. Each person takes a turn on the ball and must balance with nothing touching the ground. The person that can stay on the longest wins! 3. 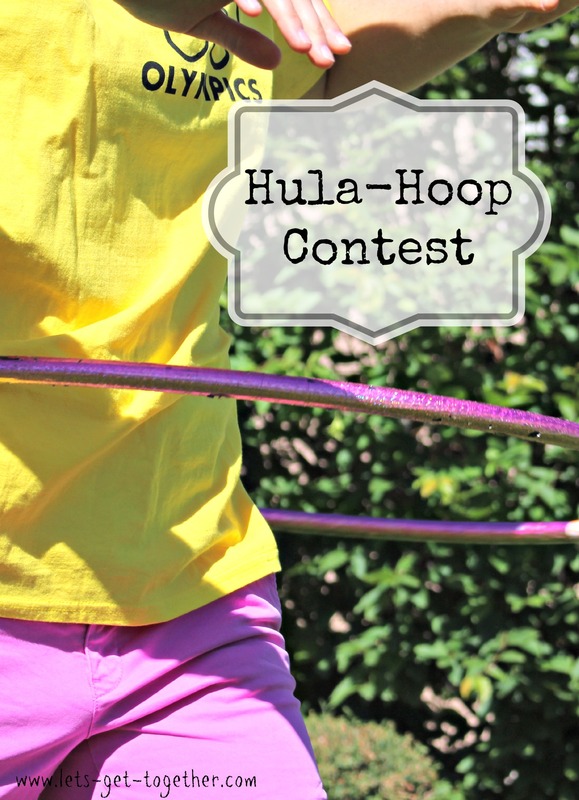 Hula-Hoop Contest: Just as it sounds, this is a simple hula-hoop contest. But get ready for some laughs, because no adults hips move like they used to. It takes some serious moving and swinging to keep that baby up and people did anything they could! So grab enough hula-hoops for the group or have one and time each person. See who has the best hips of the house! 4. Frisbee Toss: All you need for this one is a frisbee and 3 goals. 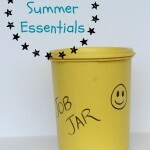 You can use buckets or hula-hoops. 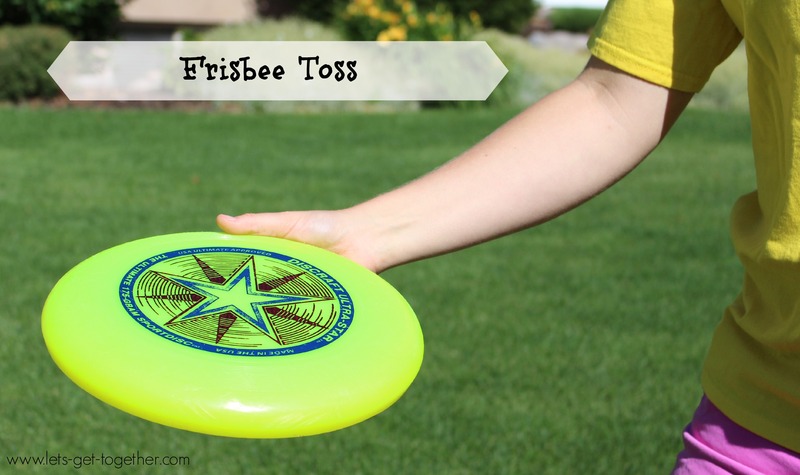 Each goal is worth a certain number of points, and each person gets to throw the frisbee 3 times. They can go for any goal they want, but in the end it is the person with the most points that wins this event! 5. 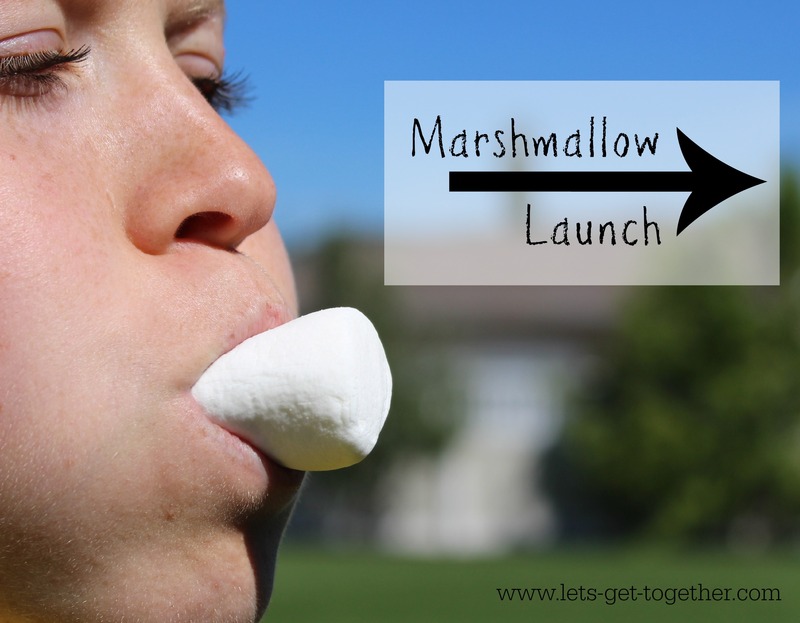 Marshmallow Launch: Get your cheeks ready! It’s time to blow! Grab some big marshmallows and give everyone two. Each person gets two tries to spit (launch?) a marshmallow as far as they can. The only rules are that you can only use your mouth and you have to stay behind the line. We even had people spinning to wind up for their spit. The marshmallow that traveled the farthest wins! 6. 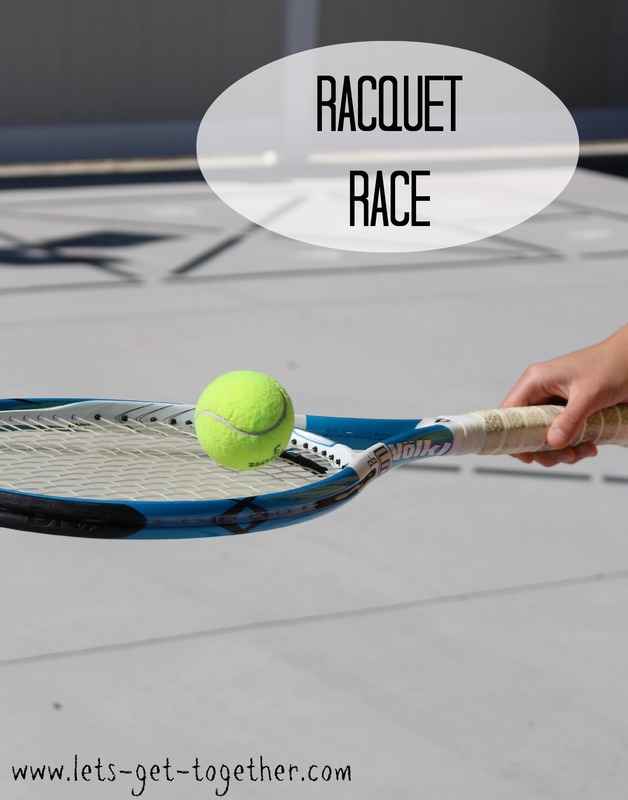 Racquet Race: Speed is your friend. Everyone gets a tennis racquet with a tennis ball. The point of this event is to balance the ball on the racquet and (speed) walk across a field or court and back the fastest. If the ball drops you must stop, put it back on, then continue. No running allowed! After finishing all the events, tally up your points and have a “closing ceremony” where the medals are awarded and the winner gets to sign the trophy. Then, after everyone had some time to revel in their glory (or not so much glory) we return the medals for next year. We like to keep things simple! So go out there and have some fun!